Complete guidance on how to diagnose and treat neurologic emergencies in any acute care setting! "This is an excellent, easy to read, concise review of common presenting neurological symptoms that are often encountered in the emergency department or hospital. The practical nature of this book is evident as the chapters are presented according to patient symptomatology instead of neurological entities. 3 Stars." --Doody's Review ServiceUniquely organized by presenting complaint, Neurologic Emergencies helps you quickly identify, evaluate, stabilize, treat, and manage the full range of neurologic symptoms--from dizziness to trauma. 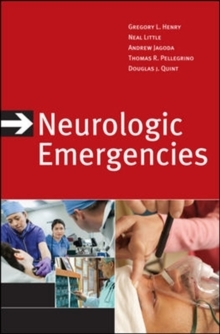 Striking the perfect balance between thoroughness and readability, this trusted classic delivers the authoritative guidance you need to ensure the best possible outcomes possible for patients presenting with neurologic emergencies.